INTRODUCTION: The fundamentals of gross anatomy are traditionally taught through cadaveric dissection. However, comprehension of abdominal cavity topography may be impeded by limited visualization and previous dissections. Although laparoscopic surgery has become routine in clinical practice, its use in normal anatomy curricula has been very limited. We hypothesized that utilization of laparoscopic videos and live laparoscopic cadaveric dissection would enhance students’ comprehension of abdominopelvic topography and abdominal wall hernias. METHODS: During the first-year gross anatomy course, we conducted two demonstrations of pre-recorded video clips of intra-operative laparoscopic explorations as well as a real-time laparoscopic exploration of lightly embalmed fresh human cadavers. The video clips of abdominal cavity topography included all four abdominal quadrants, paracolic gutters, esophageal hiatus, lesser sac, and pelvis. Intra-operative images of various abdominal wall and inguinal herniations were demonstrated. Subsequently, live cadaveric laparoscopy was used to demonstrate similar anatomic structures and landmarks. Real-time cadaveric images were correlated with intra-operative videos. After each session, pre- and post-demonstration questionnaires were completed by all students in attendance with main outcome measures including general value of the demonstrations, self-assessed degree of abdominopelvic anatomy comprehension, and degree of influence on surgical career interest. RESULTS: One hundred-two and 79 students attended the first and second demonstrations, respectively. One hundred percent of attendees returned completed surveys. On both occasions, more than 97% of respondents felt that the session was valuable and that they would attend another similar demonstration. Furthermore, 85% of students reported significantly greater understanding of abdominopelvic anatomy as a result of the demonstrations. Of students with a previous interest in surgery, 65% reported an increased interest following the sessions. Importantly, 10% of students without any previous interest in surgical career reported a development of such an interest. 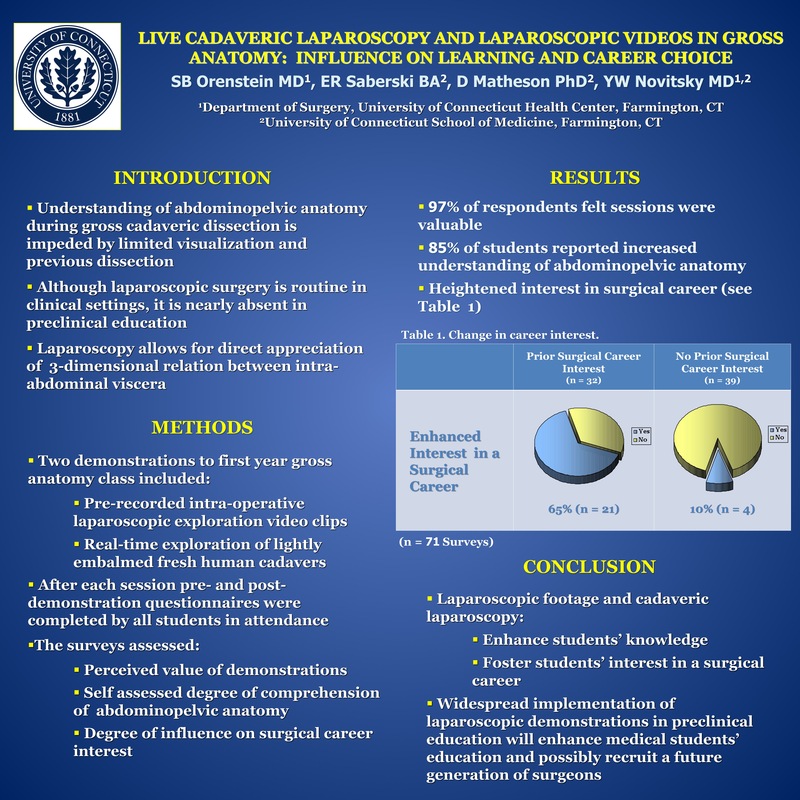 CONCLUSIONS: The use of laparoscopic video clips and live cadaveric laparoscopic exploration allowed our first-year medical students a greater understanding of abdominopelvic anatomy. It appears that the use of laparoscopic footage and cadaveric laparoscopy as an adjunct to standard gross anatomy may enhance students’ knowledge and may foster a greater interest in a surgical career. We advocate a wide-spread implementation of laparoscopy as a learning tool for junior medical students.